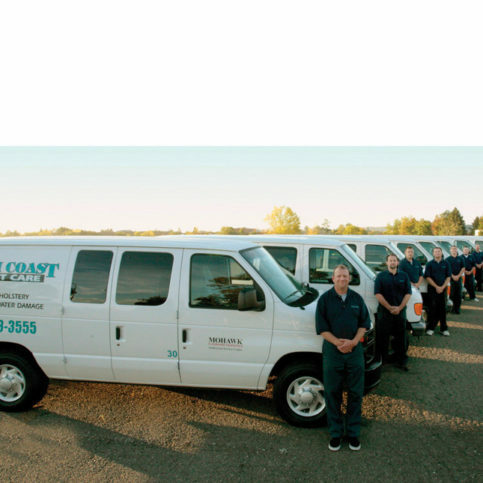 North Coast Carpet Care, Inc. If your carpets, upholstery, or area rugs are in need of odor removal, stain removal, or heavy duty deep carpet cleaning, there are excellent carpet and upholstery cleaning companies in Napa County that can help. Unfortunately, small accidents such as spills and stains are a part of everyday life. And sometimes, the carpet cleaning products at the local grocery store don’t cut it. 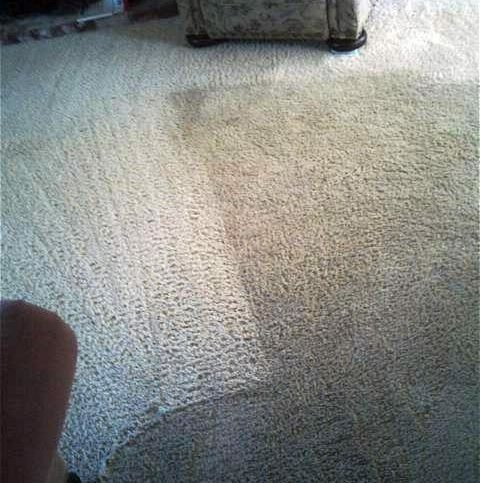 This is where the help of a professional carpet and upholstery cleaning company comes in handy. Carpet and upholstery cleaning companies in Napa County, including the larger cities of Napa, American Canyon, St. Helena, Calistoga, and Yountville, offer various carpet and upholstery cleaning services. Depending on the carpet and upholstery cleaning company, they may clean specialty textiles, drapery, wool, hand woven rugs, Chinese fabrics, or detailed carpet weaving. Some commercial companies even use special techniques to remove gun, pet urine, wine, mildew, pet odors, bed bugs, wax, tar, nail polish, wine, and dry soil from home carpet and throw rugs. First of all, when selecting a good carpet and upholstery cleaning company, you should explain exactly what you need from the carpet cleaner. When you first contact them, let them know the size of the rug or carpeting to be cleaned. Inform them of any imperfections you want corrected such as stains or burns. Be sure to thoroughly describe the cleaning services that you need as the more complex the solution, the higher the estimate will be. You may want to be conservative with your preferences in order to keep the expense at a minimum. After you’ve researched your carpet cleaner options, narrow down your choices. Look over your notes and decide which factors are the most important. As you measure by these criteria, you will be able to assess which professional carpet and upholstery cleaning companies will be able to do the job most effectively. 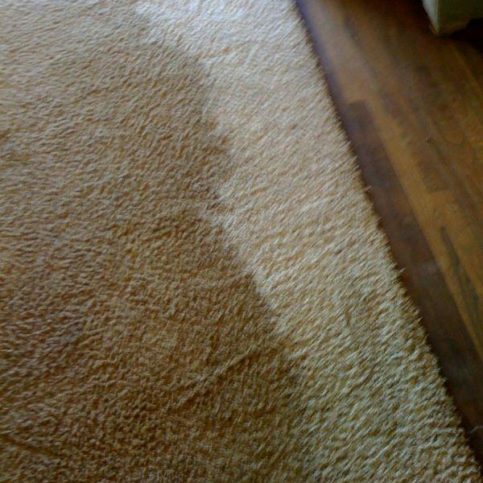 Make sure that the carpet cleaning company uses the Hot Water Extraction (HWE) method for cleaning your carpets. Be sure to ask for references for the carpet and upholstery cleaning company of choice. Make sure the company is a member of the BBB and has a good record. Be sure that your carpet and upholstery cleaning company of choice is insured and bonded. A General Liability insurance insures that if the homeowner slips and falls due to over wet carpets, the insurance will cover any expenses. A bond pays if the cleaner steals something from the house where they were working. Be sure that your carpet and upholstery cleaning company of choice is certified by the IICRC, which means that they have been through the coursework and passed exams pertaining to carpet cleaning. Ask the carpet and upholstery cleaning company if they use employees or sub contractors. Question them on whether a uniformed employee in a lettered company truck will show up at your door to clean the carpet of your home. If they use a sub contractor and something is broken or stolen from your home, chances are you may have little recourse. Cheaper doesn’t necessarily mean better. Be sure that the $9.95/room special is being done by a quality carpet and upholstery cleaning company that is certified and uses hot water extraction equipment. Usually those requirements knock the $9.95/room carpet cleaning companies out of the equation. All areas to be cleaned will be pre-sprayed with appropriate sprays to loosen soil. All areas to be cleaned will be vacuumed. Hot water Extraction with a pH balanced rinsing agent or steam will be used to remove as much soil and detergent as possible. Appropriate spotting agents will be used for pre-spotting. If required, some sort of agitation will be used. The carpet fibers will be groomed for appearance and drying purposes. Why Trust Diamond Certified Carpet and Upholstery Cleaning Companies Rated Highest in Quality? A carpet cleaning technician removes stains from carpeting. Only the best carpet and upholstery cleaning companies in Napa County have earned the Diamond Certified award by scoring Highest in Quality in the most accurate and rigorous ratings process anywhere. You’ll never be fooled by fake reviews, since all research is performed by live telephone interviews that verify only real customers are surveyed. Most companies can’t pass this test. That’s why you’ll feel confident when you choose a Diamond Certified carpet and upholstery cleaning company listed below. Simply click on the name of a Diamond Certified company below to read ratings results, informational articles and verbatim customer survey responses. 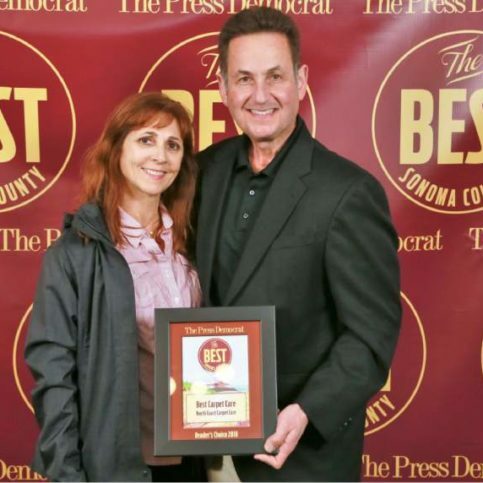 North Coast Carpet Care won “Best Carpet Care” at the Best of Sonoma County 2018 awards. Many factors should be considered before selecting a Carpet and Upholstery Cleaning Company in Napa County, including the smaller cities of Angwin, Deer Park, Oakville, Pope Valley, and Rutherford, that will meet your needs the most successfully. Write down everything that you’re searching for before you begin your research. Consider the following questions before making your final selection of a Carpet and Upholstery Cleaning Company. What services do I need from a carpet and upholstery cleaning company? If I need my carpets cleaned, what rooms do I need cleaned? The next step is to interview Carpet and Upholstery Cleaning Company representatives in Napa County, including the larger cities of Napa, American Canyon, St. Helena, Calistoga, and Yountville. Questions you may want to ask include the following. How do the carpet and rug cleaners in Napa County determine steam cleaning or carpet shampooing costs? Will the rug cleaners and carpet cleaning companies provide written estimates? 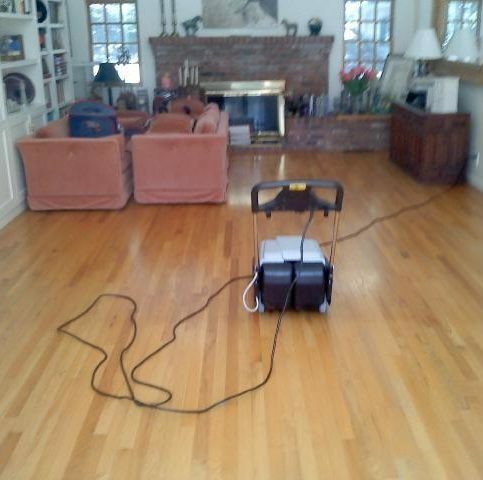 How long will it take the carpet cleaners to finish the area rug cleaning or carpet steam cleaning? Will the professional carpet cleaning companies provide warranties for their commercial carpet cleaning services? Will the commercial carpet cleaning company give a written contract for all carpet cleaning services and rug cleaning treatments? Can the commercial carpet cleaners provide references for other carpet cleaning services they’ve provided in your area of Napa County? How and when do the professional carpet cleaning companies clean up after carpet shampooing? Do you have references that I may call or before-and-after photographs I may see? It’s best to choose a Diamond Certified Carpet and Upholstery Cleaning Company because all certified companies have passed an in-depth ratings process that most other companies can’t pass. If you want quality from a Carpet and Upholstery Cleaning Company in Napa County and the greater Bay Area, you can have confidence choosing a Diamond Certified company. Diamond Certified reports are available online for all certified companies. And you’ll never be fooled by fake reviews. That’s because all research is performed in live telephone interviews of actual customers. If you can’t find a Diamond Certified Carpet and Upholstery Cleaning Company within reach, you’ll have to do some research on your own. If you do, it’s wise to call some references provided by your Carpet and Upholstery Cleaning Company. Keep in mind, though, that references provided to you by the Carpet and Upholstery Cleaning Company are not equal in value to the large random sample of customers surveyed during the Diamond Certified ratings process. That’s because references given to customers from companies are cherry-picked instead of randomly selected from all their customers. So the contractors will likely give you a few customers to call that they know are satisfied. Did they move the furniture in the room if that was needed? Did the carpet cleaner show up on time? If you need your upholstery or carpets cleaned in the future, would you consider hiring this upholstery cleaning company again? Would you recommend this carpet cleaning company to your friends and family? Were you satisfied with the service from (upholstery and carpet cleaning company name)? Your choice of a Carpet and Upholstery Cleaning Company is important to you and your family. So before deciding on the best Carpet and Upholstery Cleaning Company in Napa County for you, it’s important to consider the following questions. What is the time frame that I need this accomplished in? Is my company of choice charging a reasonable price for their carpet and upholstery cleaning services? Does my upholstery and carpet cleaning company of choice use the hot water extraction method? Does my company of choice have good references that I have checked? Is my company of choice well-established in the community? Is my carpet cleaning company of choice certified by the IICRC? Now that you’ve found a local carpet and upholstery cleaning company in Napa County, including the smaller cities of Angwin, Deer Park, Oakville, Pope Valley, and Rutherford, that meets all your ideals, it’s the perfect time to ask for a written contract. This contract should include written details on the price, quality and materials to be used, as well as the job start date and intended completion date. Before signing the contract, read and be sure you understand all the terms and limitations. The contract you sign is binding, and should protect your property and your interests, as well as those of your contractor. For this reason, you should never sign a blank or incomplete estimate. When signing the contract, remember to write in special requests or verbal agreements. This will protect you and help ensure you get the services you have agreed on. Along with end dates and any special instructions, these add-ons may also include related issues that aren’t always covered by a standard contract. For example, regardless of how careful your contractor promises to be, sometimes damage can unexpectedly occur when installing carpet. But you can protect your property by being proactive. Before the work begins, schedule a walk through with the company supervisor and conduct a pre-work inspection of your property. List or photograph your home or business and the areas surrounding where the carpet will be cleaned. Speak with a company representative about reasonable expectations for protecting your home or business during the work. When you’ve reached an agreement, both you and the contractor should sign and date the document. When the work is done, do a final inspection together and verify that your expectations were met. When you’re comfortable with the information your carpet and upholstery cleaning company has given you, sign the estimate and service agreement. Verify that the carpet and upholstery cleaning company representative has a phone number where they can reach you at all times. If the actual price exceeds the amount agreed upon on your estimate, be sure that the carpet and upholstery cleaning company representative gets your final approval before moving ahead with installing the carpet. Your approval must be noted on the estimate and the invoice. Remove any items of value. Store them behind a locked door or in the trunk of your car to ensure that they aren’t stolen. If necessary, move furniture. Some carpet cleaning companies offer a discount if you clear the room for them; others charge a fee for moving furniture. Be sure to ask about this factor when you meet with your carpet and upholstery cleaning company. Free up a parking space for the carpet cleaner’s vehicle. Sometimes a carpet cleaner will use truck-mounted equipment so they will need to be close to an entry door in order to run hoses for their cleaning equipment. Make sure your personal vehicles aren’t obstructing them. Remove small items such as floor lamps, waste baskets, toys, or shoes from the floor of the area to be cleaned. You may want to lift up and secure items such as bedspreads, drapes, or dust ruffles in order to prevent them from getting in the way of the carpet cleaner. If needed, vacuum. This will remove as much debris and dirt from the carpet fiber so that the cleaning company can focus on the deep down, soiled-in dirt. Remove fragile items such as porcelain knick-knacks, vases, collectibles, and any potentially fragile or breakable items. Dust and clean baseboards and HVAC registers. This will clear these areas of any dirt and debris, ensuring that the carpet stays clean immediately following a cleaning. Be sure to show your professional carpet cleaner the spots, stains, and high traffic areas that you are most worried about. This way you will ensure that these places are not missed during the cleaning process. It’s the carpet and upholstery cleaning company’s responsibility to sell and install quality carpet using the best possible carpet and installation techniques. But you play a big part in the success of your carpet and upholstery cleaning company, too. Here are a few simple steps you can take to be a good customer when hiring a Napa County carpet and upholstery cleaning company. Ask your carpet and upholstery cleaning company if you should call to check on the progress or if he will call you with updates. Before hiring a carpet and upholstery cleaning company in Napa County, restate your expectations and goals, and reiterate to the carpet and upholstery cleaning company representative your understanding of the agreement. Most problems with local Carpet and upholstery cleaning companies occur because of a breakdown in communication. By being clear about your expectations and theirs, you can avoid most conflicts. Be sure your service representative has a phone number where they can reach you at all times while they’re installing your carpet. The work will move along more smoothly if your carpet and upholstery cleaning company can reach you for any necessary updates, questions or work authorizations. When your contractor contacts you, return calls quickly to keep the carpet company on schedule. Be clear and upfront with the carpet and upholstery cleaning company representative. Let them know what you want from your carpet company, the long-term outcome you’re expecting and specific ways they can satisfy your expectations. Pay for the carpet and upholstery cleaning company work promptly. Why would you want to be a good customer? Carpet and upholstery cleaning companies in Napa County, including the larger cities of Napa, American Canyon, St. Helena, Calistoga, and Yountville, appreciate customers who are straightforward, honest and easy to work with. Your good customer behavior sets the tone from your end and creates an environment conducive to a good relationship. Things may very well go smoother and any problems may be more easily resolved. What the satisfaction guarantee covers. This should include whether the shop will give you a refund. Any exclusions must be explicitly stated. Your responsibility in the case of a problem with the work of the carpet cleaning company and what you need to do in order to redeem the satisfaction guarantee. How long the satisfaction guarantee is valid. Carpet cleaning companies in Napa County, including the larger cities of Napa, American Canyon, St. Helena, Calistoga, and Yountville, provide all types of cleaning services. Following is a list of the most popular services. Carpet cleaning companies will clean the carpet and upholstery in your automobile on location at your home. RVs and boats can also be cleaned. 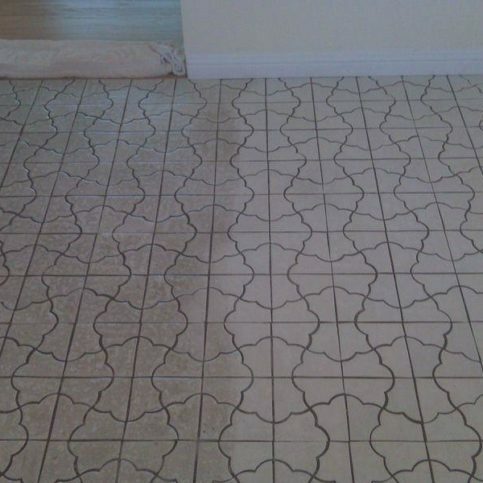 Carpet cleaning companies offer a cleaning service that powers away build-up and restores grout lines on tile floors. 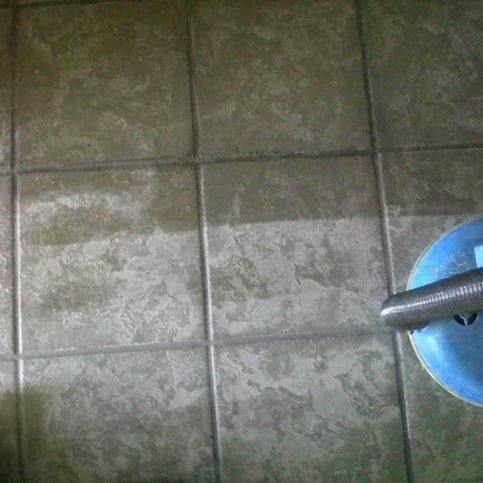 The procedure includes a cleaning solution and a high-pressure spray that blasts away the dirt and build-up, leaving the tile floors and grout looking new again. Carpet cleaning companies have the ability to clean your lamp shades so that, instead buying new lampshades, the old ones can be refreshed and cleaned, bringing them back to life. Because everyone’s carpet is unique in color, style, fiber, density, and texture, the dirt, spots and stains in the carpet are different, too. 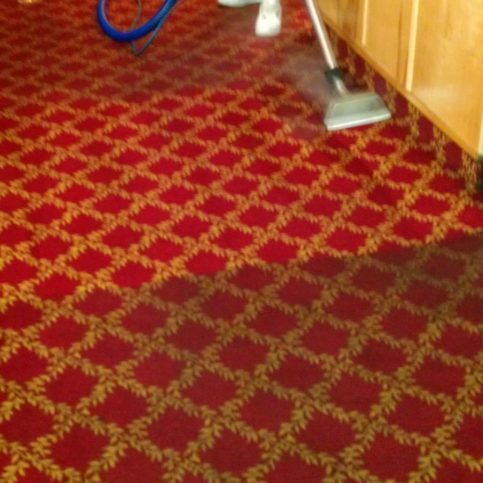 A quality carpet cleaning company will customize the solution to fit your needs individually. Proper pH balances, mixtures, and spot and stain removal are all considered. Carpet and furniture protectant is a service provided by carpet and upholstery cleaning services that offers extra protection against permanent staining of your carpet and furniture. Upholstery cleaning companies have a cleaning process that guarantees no shrinking so that you don’t have to take your drapes to the dry cleaners. Many carpet cleaning companies are able to clean your drapes while they hang. Pet odor removal is a service that specializes in the removal of odors from pets. A bacterial enzyme product is used that consumes the bacteria that are the root of the odor problem. Rather than masking the odor, its source is destroyed. Upholstery cleaning is a service that cleans a wide variety of fabrics, leaving your furniture sparkling clean. Upholstery and carpet cleaning companies are able to clean most types of vertical blinds from fingerprints, dirt, oil, and dust. Carpet and upholstery cleaning companies are able to clean the air ducts in your home by using a high-powered vacuum system paired with a rotary brush system that dislodges and removes contaminants such as dust, dirt, bacteria, mold, etc. that is often found in air ducts. This improves the quality of the air inside your home so that you have a healthier home environment. Many companies are on the market for carpet cleaning products. Following is a list of popular carpet cleaning brands that have had great success and have a good reputation. Below are key carpet and upholstery cleaning company terms and descriptions that will help you navigate your way through your carpet and upholstery cleaning from beginning to end. This is a reference to professionally shampooing an area rug. The material used to form the base of the carpeting into which the pile is attached. Biodegradable refers to the detergent in the carpet cleaning products that can be broken down in order to reduce the amount of surfactants discharged into the environment. This breakdown process prevents the product from being toxic to aquatic life. A products that whitens, cleans, and removes stains as well as brightens fabrics. Brown carpet discoloration is caused by over-wetting the carpet either with water alone or with a carpet cleaning product. Caused by adding layer after layer of floor finish over dirt without scrubbing the old layers of dirt away first, build-up is a heavy deposit of floor finish, dirt, grime, and wax. Carpet cleaning is a reference to cleaning carpet for the purpose of removing stains, dirt, grit, sand, and allergens or simply restoring the original beauty of the carpet. Carpet shampoo is shampoo specially designed for carpet in order to remove stains, dirt, grit, sand, and allergens and restore the original beauty of the carpet. Cleaning is locating, identifying, containing, removing and disposing of unwanted pollutants from the environment. A cleanser is a powdered of liquid cleaning product that contains abrasives, surfactants, and usually a bleach. The ability of carpet fiber to hold its dye-or coloration. Commercial carpet cleaning is a carpet cleaning service provided by a commercial company. The purpose of cleaning a carpet commercially is to remove stains, dirt, grit, sand and allergens and restore the original beauty of the carpet. 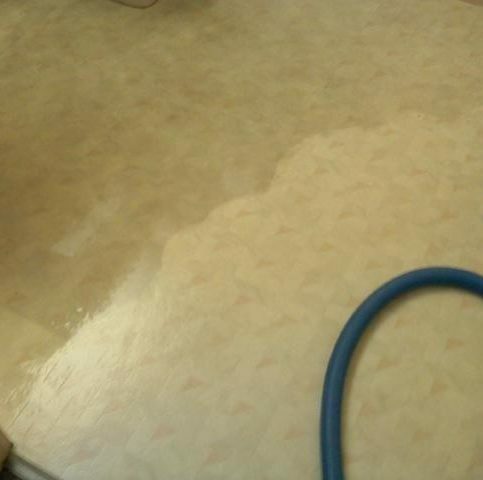 A degreaser is a specialty product that removes grease from hard surfaces. 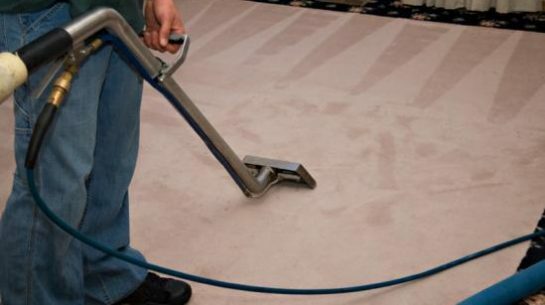 Dry carpet cleaning involves the use of specialized machines in order to clean carpets with newly developed chemical technologies that permit very low moisture cleaning. This process results in the beautification of the carpet as well as the removal of stains, dirt, grit, sand and allergens. Dry foam carpet cleaning is a method that uses a specialized carpet cleaning machine to lift embedded soil from the carpet fibers. Typically the carpets will dry in about one hour when using dry foam. The method of cleaning carpet in which a cleaning solution is injected into the carpet and the soiled solution is then quickly vacuumed back into the extraction machine. Green carpet cleaning refers to the process of cleaning carpets with the use of environmentally friendly cleaning products. Green cleaning considers human health and environmental impacts. Home carpet and upholstery cleaning refers to the process of cleaning the carpets and upholstery within a home. Natural carpet and upholstery cleaning refers to the process of cleaning carpet and upholstery with cleaning products that are safe for the environment. This means that the cleaning products do not have toxic fumes or harsh chemicals. A special chemical that contains enzyme-producing bacteria. These bacteria actually digest organic spills and stains from carpeting such as urine, vomit, and feces. Oriental rug cleaning is the process of cleaning an oriental rug in a way that removes the dirt and residue without causing damage to the elegance of the rug. Over wetting is the application of too much product. 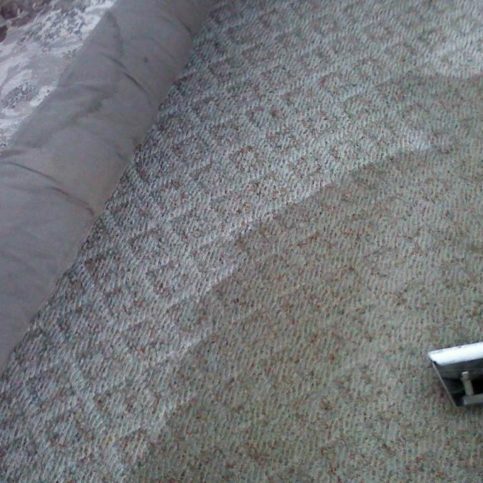 If a carpet becomes too wet, the primary or secondary backing may release a dye like substance that causes the tips of the carpet fibers to become yellow or brown. Persian rug cleaning is the process of cleaning a Persian rug in a way that removes the dirt and residue without causing damage to the elegance of the rug. Rug cleaning refers to the process of cleaning a rug in order to remove stains, dirt, grit, sand and allergens and restore the original beauty of the rug. Steam carpet cleaning refers to the process of cleaning carpet in order to remove stains, dirt, grit, sand and allergens and restore the original beauty of the carpet through the use of a specialized cleaning machine that uses steam. Sections of carpet the receive the most wear and use such as hallways, steps, and entranceways, and require frequent vacuuming and cleaning in order to maintain appearance. Truckmount carpet cleaning refers to the process of cleaning carpet through the use of a truck mounted carpet cleaner, a cleaning unit that is generally mounted to the floor of a van or trailer. 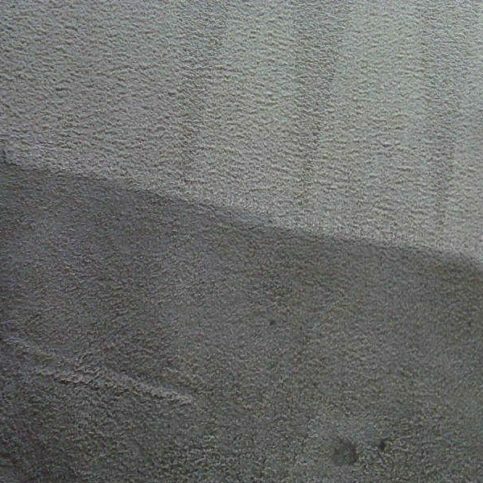 The cleaning method of a truck mounted carpet cleaner is hot water extraction. Upholstery cleaning refers to the process of cleaning the upholstery of furniture from dirt and dust. Because upholstered furniture often has intricate shapes and delicate fabric that is difficult to clean, it is important to use a professional cleaning service that can effectively remove the dirt and grime from the furniture and restore it to its original beauty. Q: Why choose a Diamond Certified carpet and upholstery cleaning company? A: Diamond Certified helps you choose a carpet and upholstery cleaning company with confidence by offering a list of top-rated local companies who have passed the country’s mostin-depth rating process. Only carpet and upholstery cleaning company rated Highest in Quality earn the prestigious Diamond Certified award. Most companies can’t pass the ratings. American Ratings Corporation also monitors every Diamond Certified company with ongoingresearch and ratings. And your purchase is backed by theDiamond Certified Performance Guarantee. So you’ll feel confident choosing a Diamond Certified carpet and upholstery cleaning company. Q: Is there a different in what type of carpet an upholstery and carpet cleaning company cleans? 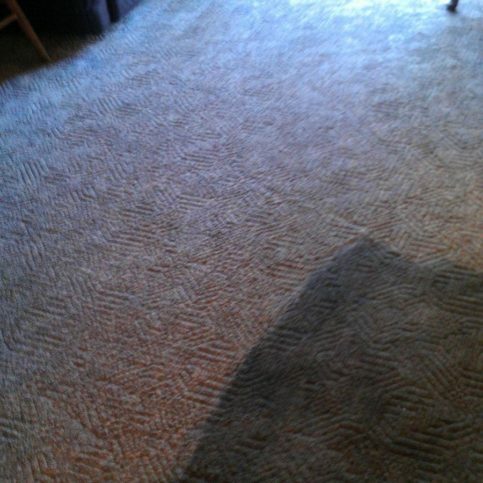 A: There is a different in the type of carpet that is being cleaned and the level that can be extracted. For example, Berber carpets clean well but often have reappearing stains in the next few days after they have been cleaned. Frieze carpets hold moisture so they must be done over more frequently or have an air mover readily available. 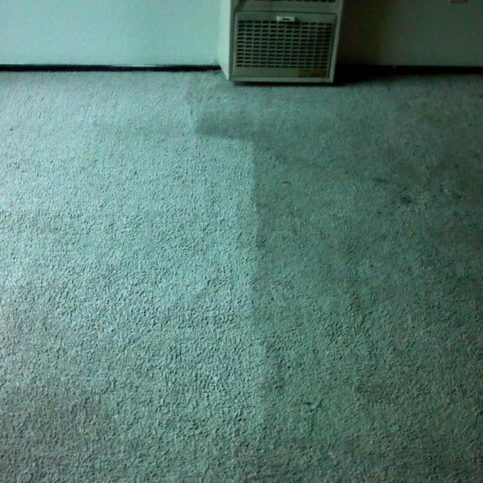 These differences should be addressed with your carpet cleaner company of choice during your initial interview. Q: What is the normal dry time after carpets are cleaned? A: Usually, if there is ventilation in the room or if it is a warm day, it will take anywhere from 3-6 hours. This is dependent on the carpet and conditions. A: There are some permanent stains that can never be removed. These should be addressed by your carpet cleaning professional when he inspects your home before cleaning it. Some of these permanent stains that are almost impossible to remove include pet urine stains or any type of artificially colored stains. However, they can often be lightened. Q: Is it better to have your carpet steam cleaned or chemically dry cleaned? A: Steam cleaning is both a surface cleaner and a deep penetrating cleaner. It will remove surface stains as well as deep clean down into the carpet pad where bacteria and other stains remain. You will need to speak with a carpet cleaning professional regarding the advantages and disadvantages of both. Q: Is it better to get an estimate over the phone or in person? A: It is always better to get an estimate in person as there are too many factors involved in cleaning your carpets that can’t be answered over the phone. If an upholstery cleaning company does give you a quote over the phone that sounds low, be aware that low cost often means poor service. Q: How much better can a professional clean my carpets than doing it myself? A: Equipment and type of chemicals used in the cleaning process are huge factors when cleaning carpets. For the most effective carpet cleaning, a professional is the best choice. A professional has the experience to give you the quality of cleaning you need as well as the cleaning power that isn’t available on the consumer level and will be the most effective. A: All cleaning chemicals have hazardous levels that range from good to worse. However, there are also natural chemicals that some carpet cleaning companies use. Ask your carpet cleaning professional about what type of chemicals they use. Q: What should I look out for when being charged for carpet cleaning? A: Some companies charge by the rooms they clean and others by square footage. Be sure to ask for referrals, what they do to prepare your carpets for cleaning, and what type of system they use. Customer satisfaction should always overshadow price by a few dollars. Q: What should I watch out for when looking for a carpet cleaning service company on the internet? A: Be sure that they are licensed and insured. Also ask for references and how many years the carpet cleaning company has been in business. Last of all, inquire if the company is owner operated as there is a level of pride that goes along with owning your own business and running it well. Q: Is it best to put off having my carpet cleaned for as long as possible? A: Many major carpet mills recommend professional cleaning your carpets at least once per year. The build up of soil in the carpet in combination with foot traffic creates abrasion that breaks down the fibers of the carpets. Professional cleaning removes the dirt and grime deep within the carpet and restores its natural beauty. Q: My carpet has bleached or faded spots. 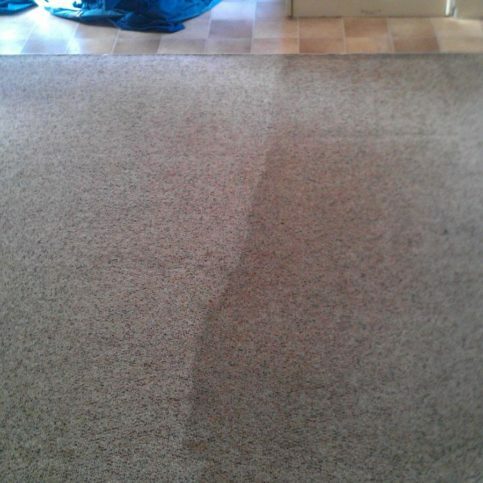 Can a professional carpet cleaning service correct that? A: If there is color loss in the carpet, it may be possible to spot dye it. Another option is to do a carpet repair by replacing that area of carpet with another piece.